Hello! 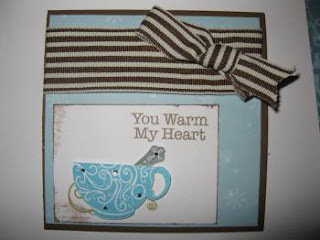 I have just made this card using Mojo Monday's sketch challenge 221. The paper is Wonderland, which is on page 58, and the stamp is A Sip, which can be found on page 71 in the current Close To My Heart idea book. I also used Crystal Blue for the cup, Grey Wool for the spoon. The sentiment is stamped in Chocolate, and the swirl is stamped in Desert Sand. Oh, and you can't forget the itty bitty sparkles too! Those can be found on pg 126. I had fun making it, and I hope you enjoy it! This card is very cute. Pretty blue.